By Monica I. Feliú-Mójer, Ph.D.
"My biggest satisfaction has been to graduate the program’s inaugural class of students." This is how Dr. Lorna Cintrón- González describes the first great milestone of an adventure that began four years ago. 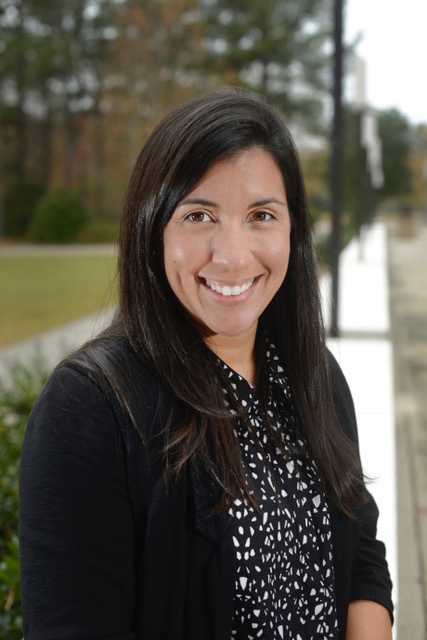 In August of 2013, she joined the faculty of the Department of Physics and Astronomy at Francis Marion University (FMU), as assistant professor and coordinator of the first baccalaureate program in industrial engineering in the history of this academic institution in South Carolina. Cintrón-González has embraced her role as a pioneer. She was the first professor in industrial engineering at Francis Marion University. During her first two years there, she was not only the first, but the only one. She came to the institution shortly after graduating with a doctorate in this discipline and a specialty in ergonomics from Penn State University, to start and lead the first program in industrial engineering at FMU. "My work as a coordinator consists predominantly of teaching, but I also spend a lot of time establishing relationships with industry for the benefit of students and the program. In addition, I am leading the preparation for the program to be accredited by the Accrediting Board for Engineering and Technology (ABET), which will help give it prestige and recognition," she says. The FMU industrial engineering program is special because the school is predominantly liberal arts. In addition, it is the only program of its kind in the Pee Dee region in northeastern South Carolina, and one of two in the state. One of the main reasons for its creation was the need of local industries to hire and retain engineers in the region. "The majority of our students are from here and they want to study and eventually work and contribute here," she shares. This local approach allows the young program to be responsive to the needs of nearby companies, many of them in manufacturing. In addition to cultivating local opportunities for her students, Cintrón-González seeks to broaden their horizons. In 2015, she helped develop an exchange program with an applied sciences university in the small town of Jena, Germany. FMU will receive its first two exchange students next semester. In May 2017, the professor taught a 3-week course on sustainability. "This course was offered to students from all disciplines, at the European Academy in Otzenhausen, Germany. We learned about conservation efforts and, as a class project, the students developed a proposal for small changes we can make at FMU to contribute to environmental conservation," she recalls. For Cintrón-González, who holds a bachelor's degree in industrial engineering from the University of Puerto Rico in Mayagüez (RUM) and a master's degree in health systems from the Georgia Institute of Technology, the opportunity to be a professor and coordinator of the industrial engineering program at FMU "has been challenging and enriching. I have had the pleasure of building this program from the beginning and have had many experiences that have made these last few years unforgettable. " When asked what she enjoys most about her work, Cintrón-González responds without hesitation: "making a difference. I am passionate about being able to influence the careers of future engineers. The population we serve is mostly African American and very low-income. A large portion of the students we have at FMU are the first in their families to go to college. If it wasn’t for this university many of could not have the opportunity to study engineering," she adds. "This makes our work even more important." Like many young people, this professor raised in San Juan and born in Caguas did not know which field or profession to choose when she was going to college. What she did know was that she liked science and mathematics. "As soon as I took my first class in industrial engineering at the Colegio (RUM), I found what I was looking for: an engineering field that is both technical and human, since industrial engineering focuses, in part, on the efficiency and safety of people at work," she remembers. Her experiences inspire her now as an educator. "I love teaching and sharing my experiences with my students." Cintrón-González also enjoys mentoring and helping students as way to pay it forward, as mentors have played an important role in her success. "My best mentor has been my mother. Her unconditional support has been my driving force during this journey. Dr. Sonia M. Bartolomei at the RUM has always been a great source of inspiration and support. And since I started at FMU, Dr. Peterson, the director of the Department of Physics and Astronomy, and who recently passed away, was very supportive and counseled me during my early years in this position," she tells us. In addition to her work at the university, Cintrón-González volunteers at area schools to promote engineering and science, technology, and math fields (collectively referred to as STEM). Another source of motivation for this mother of two girls is precisely to be an inspiration to girls and other women to aspire to leadership roles in STEM. "At first, it was challenging and sometimes frustrating to be a mother and an academic. It was difficult to find a balance, but I have managed to take advantage of the flexibility offered by the profession to be able to have more time with my two daughters, especially during the summer months," she says with honesty. To conclude, Cintrón-González shares this message for those interested in pursuing a career in STEM: "In a world where technology threatens to deteriorate the value of humans being in every sphere, we have to maintain the perspective that it is for us the humans in STEM, and our work in research and application, that technology has gotten to where it is. We have to work hard to get ahead, to set the example and make a difference."